The Halvorson house exemplifies a shift in architectural trends, from Traditional to Modernist. Executed in the International style, a subset of Modernism, the house had a flat roof, smooth wall surfaces, a horizontal orientation of the walls and windows, and no external ornamentation. When first built, the house was noted for its many automatic devices and gadgets which controlled heating and cooling, watered plants, and turned on cupboard lights when a door was opened. Twenty-six thermostats regulated temperatures throughout the house. When the doorbell was pushed, a front door speaker announced the residents’ location. Edythe passed away in 1988, and Roy sold the house the next year. It was demolished in 1994 — the same year Halvorson died — for construction of another house built on the lot in 1996. 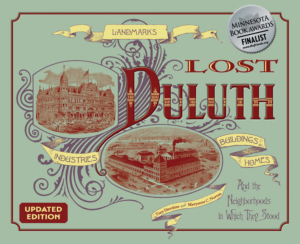 From Lost Duluth: Landmarks, Industries, Buildings, Homes and the Neighborhoods in Which They Stood by Tony Dierckins and Maryanne C. Norton (Zenith City Press, 2012), featuring over 400 historic photos, illustrations, and lithographs. Click on the cover to preview the book.